truth is hard to come by in these fair well spoken days…. …and to put into context small improvements, consider that international competitiveness relies on very narrow margins. The small improvement or deterioration that puts you above/below the group of most competitive nations in the world will have dramatic consequences. Another way to state it is that there are strong inflection points in the relationship between effort/reward curves and prosperity. You are, after all, competing with other nations worldwide. Think of the fate of the American auto industry in the ’80s when it crossed that point. It never recovered. As more industries and individuals are asked to pay a “slightly fairer share” and swallow up a few more regulations, more and more of these industries are crossing the tipping point against international competition. Prosperity leaves and cannot be cordoned in by prohibitions on inversions. If anything, that gives even more advantages to completely foreign entities in which Americans are not involved in any way (except perhaps as “despicable” investors). I agree that the Armey numbers are too high. I also agree with Zorba’s analysis, however, I would point out that the more dramatic the cuts, the more dramatic the responses. For example, Coolidge dropped the top rate to 25% from the top WWI rate of 77%. Kennedy dropped the top rate to 70% from over 90% in the Eisenhower years. Reagan dropped the top rate to 28% from 70%. In each case, there was dramatic improvement in tax revenues collected. On the other hand, the Bush 2 reductions were only marginal from 39.6% to 35%, so the response time was longer for tax rate related additional growth to kick in. We were also facing a flurry of growth slowing regulations in the early 2000’s that obscured tax rate improvements. A better way to compare these numbers is to look at them from the tax payer’s perspective to see what the tax payer got to keep. Coolidge, kept 75% verses 23%. Kennedy, kept 30% verses 10%. Reagan, kept 72% verses 30%. And Bush 2, kept 65% verses 60.4%. In the first three, tax reductions at least doubled returns, whereas under Bush there was only slight improvement. The Laffer curve has no context without a time horizon. For example, the Laffer curve for tomorrow is indeed as the left imagines it: A flat line. You double taxes today and revenue nearly doubles tomorrow. Nobody is going to quit their job the day after taxes double (ok very-very few). They are going to wait to see if the change is for real, if it is permanent. Then they will work with less enthusiasm and soon their companies will start losing on international competition, then some will quit, some will get laid off. Further down the time horizon people will then start making French style lifetime choices: It ain’t worth it. Louis was so smart, tried to build a company to compete with Apple Inc., the lower motivation of the heavily taxed and welfare padded French workers was never able to beat the American company, the French Apple failed, Louis wasted most of his youth and has few spectacular results to show for. Hence mediocrity is a better compromise point between stress and reward overall”. These longer term effects take some years to materialize – and are virtually impossible to reverse once they take hold (see French voting patterns). So what does that mean for the Laffer curve? 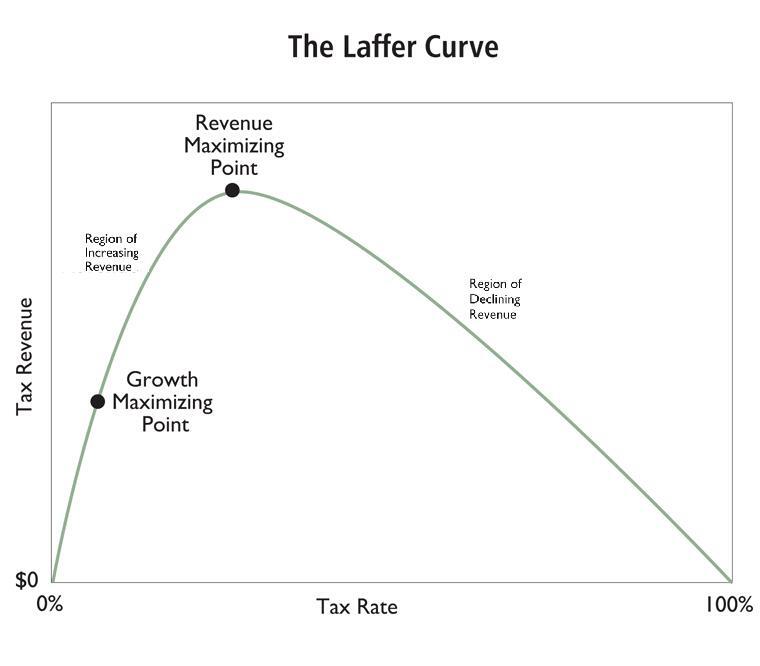 As I said, it means that the Laffer curve must be accompanied by a time horizon context. It means that the Laffer curve looks different as you expand the time horizon. The Laffer curve for tomorrow is a leftist fantasy flat line. The Laffer curve for next year looks similar to the way it is typically drawn. HOWEVER, as you expand the time horizon the peak of the Laffer curve occurs earlier and earlier. a)	As the time horizon expands, all the adjustments, and behavior modifications start kicking in. b)	As growth compounds, growth becomes the dominant factor in GDP and hence also in government revenue. To illustrate point b) consider that quite likely Switzerland raises more per capita tax from each Swiss citizen than France raises from each French person. The simple reason is that after decades of faster growth, Swiss per capita income is double the French per capita income. Although France levies an average total tax of 55% (approximate) from its heavily taxed citizens, Switzerland at about 35% (again approximate) raises more per capita tax in absolute terms, from its lighter taxed citizens. The main reason: Decades of compounding growth divergence. Hence the Rahn curve.